Home education Entertainment Government Lifestyle News Philippines House Bill 6079 Aims to Criminalize Parents who Refuse to Support their Children. 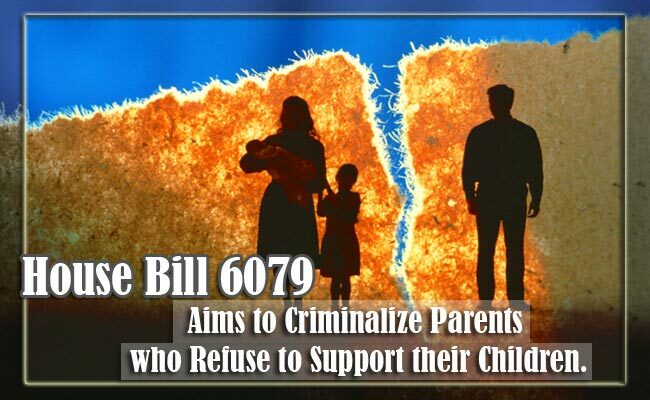 House Bill 6079 Aims to Criminalize Parents who Refuse to Support their Children. Fathers who do not support their children might end up in jail if Manila Rep. Rosenda Ann Ocampo’s new House Bill pushes through. The House Bill 6079 aims to criminally charge fathers who refuse to give support to their children. If the new bill becomes a law, parents who fail or refuse to give their children legal child support with no justifiable reason will end up in jail for two(2) years. the child support will be based on the determined amount set by a court under the Anti-Violence Against Women and Children Act of 2004 ( Republic Act #9262) or based on the parenting agreement approved by court. According to the bill, if the parent does not give legal child support of 30,000 in total or failed to give support for six months, a criminal liability could be charged. The law was also takes note of the fact that there are fathers who are the legal guardians of their children. The bill also relates to the parents who have legal custody to the child. The law was created due to the fact that some parents fail to fully pay the required amount deemed by the court. Some pay partial payments while other fail to give any support for a long time, thus they are penalized. Under the House Bill 6079 those who are found guilty will receive a penalty of Php 25,000 or will be put in jail in no less than six months but nit more than a year with the additional lump sum of the unpaid child support. Theses consequences are for the instance of first violation or first failure to comply. If the offender once again failed in giving legal child support, he will be fined with Php50,000 or will be imprisoned for a year but not more than two years with additional lump sum of the unpaid legal support. According to Ocampo, the bill was created due to the difficult issue of child support in the country. The issue roots when couples separate and custody goes to either of the parent. The parents who has the custody does not only end up with emotional trauma, but also with the responsibility to single handedly raise the child without any support from the other parent. Ocampo also added that the current law does not criminalize those who fail to support their children, though the custodial parents can file a motion that obliges the other for refusal to comply with the court order. The bill is still set for further deliberations with House Committee on Welfare and Children.